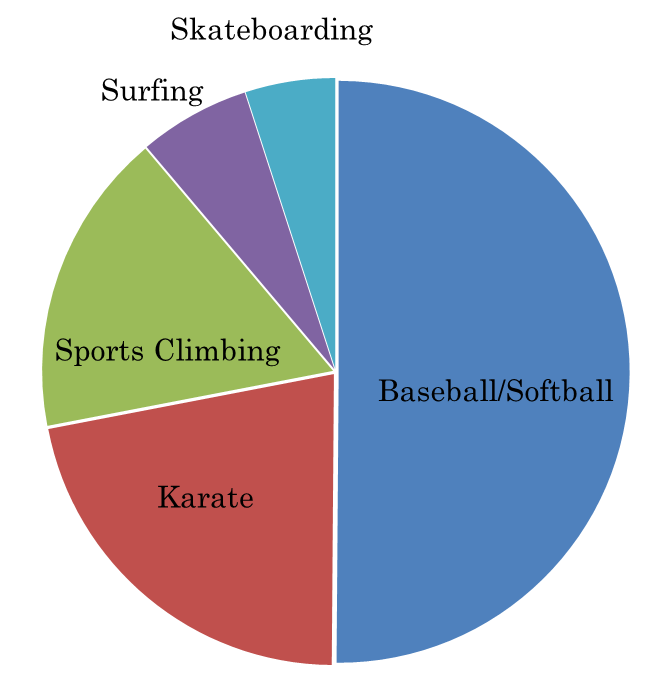 According to a poll conducted by Nikkei in August, 50.1% of Japanese say they are most interested in baseball/softball among the five additional sports in 2020 Tokyo Olympics, followed by karate at 21.8%, sports climbing 16.8%, surfing 6.2% and skateboarding. The Nikkei’s on-line poll received 423 replies which comprised 97% men and 3% women. The age grouping of the respondents was: 5% in their 20’s, 10% in 30’s, 17% in 40’s, 24% in 50’s, 30% in 60’s, 10% in 70’s and 3% in 80’s. The respondents on baseball/softball are concerned about the absence of MLB’s top players from 2020 Tokyo Olympics and urge the need to promote the sports globally in order to remain as an Olympic sport after 2020 in Tokyo. Overall, the respondents called for spending cuts of the event under the newly elected Tokyo metropolitan mayoress Koike.